Small pens and comfortable writing experiences do not normally appear on a list describing the same pen. But ever since this TWSBI Mini entered my collection, I've been continually impressed by its portability and quality writing experience. The particular model I have is a clear body with a black cap and piston. It currently has an EF nib, and it's my favorite non-Japanese small nib. I currently have Pilot Iroshizuku Kon-peki in the pen, one of my favorite go-to inks. A lot of mini-sized pens have significant trade offs in the actual usage of the pen, but the TWSBI Mini isn't one of them. I love the size. It's portable and small, but still maintains the proper proportions of a larger pen that makes it easy to hold for long sessions or a quick commute in my pocket. When the cap is posted, the weight is perfectly balanced for my hand. I really enjoy posting the cap on this pen because the cap actually screws on to the end of the pen. This gives it a solid, secure feel in the hand and I don't have to worry about twisting the cap and moving the piston, which might result in a nasty ink spill on the page. The nib is extremely smooth and consistent (especially for an EF nib), which is one of the main reasons that I pick this pen up in the morning. I've never had issues with the ink stopping or skipping in this pen. Even with other inks loaded, it performs admirably. While we're talking about inks, it's worth pointing out that this little pen holds a large amount of ink. I've used the pen on a variety of papers, from cheap copy paper and composition notebooks to Rhodia and Clairefontaine papers. It feels smoother and nimbler on the premium paper, but it also gets the job done nicely on cheap papers. In my mind, this is what qualifies a pen for everyday use. The relatively low cost of entry for this pen is another huge plus. I paid $55 for my copy from Amazon, which is hard to do with a piston filler fountain pen. I wouldn't necessarily recommend this pen to someone just starting on their fountain pen journey, but if you want something small, charming, and deceptively refined, then give the Mini a try. The Mini comes in three color variations: black and clear, completely clear, and all black. 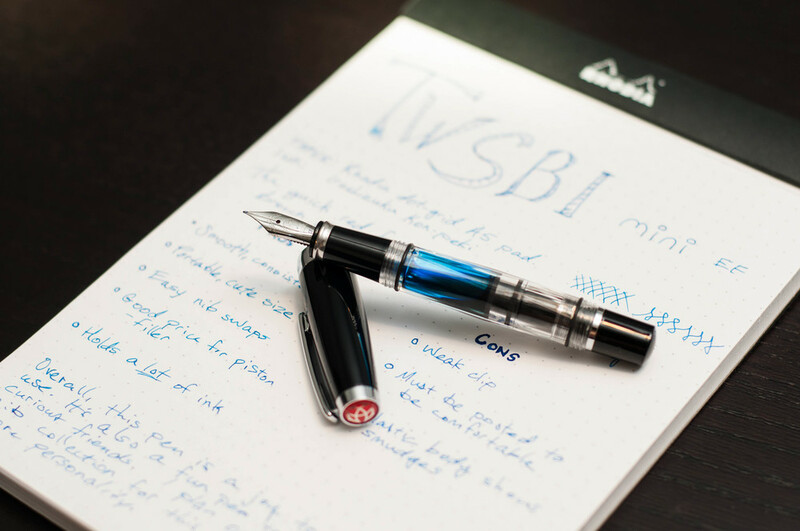 You can pick the nib size you want, but like other TWSBI models, the nib section is incredibly easy to swap out later if you want to try other sizes. Posted on October 21, 2013 by Jeff Abbott and filed under Fountain Pens, Pen Reviews, TWSBI.